Those maverick Swedes, IKEA, are at it again. They've been having a little bit of fun in the run up to this years election. 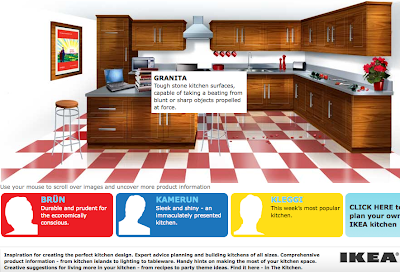 The three main party leaders have had a bespoke kitchen created, each of which has its own distinctive style to compliment and support their respective chief. Find out more about items like the Kamerun Etontabl Bullindone, the Brun Granita and the Kleggi Toste here. Nicely done.